The Hispanic population is expected to reach about 106 million in 2050, about double what it is today, according to new U.S. Census Bureau population projections. But the new Hispanic population projection for 2050 is lower — by nearly 30 million — than earlier population projections published by the bureau. The nation’s Hispanic population has been one of its fastest growing in recent decades. Since 1970, the Hispanic population has grown 592%, largely because of the arrival of new immigrants from Latin America — especially Mexico. By comparison, the U.S. population overall has grown 56% over the same period. Between 2000 and 2010 alone, Hispanics made up more than half of U.S. population growth. These demographic changes have implications for population projections. For example, in 2008, the bureau projected the Hispanic population in 2050 would be 133 million, about 35 million higher than the 2050 projection published by the bureau in 2000. 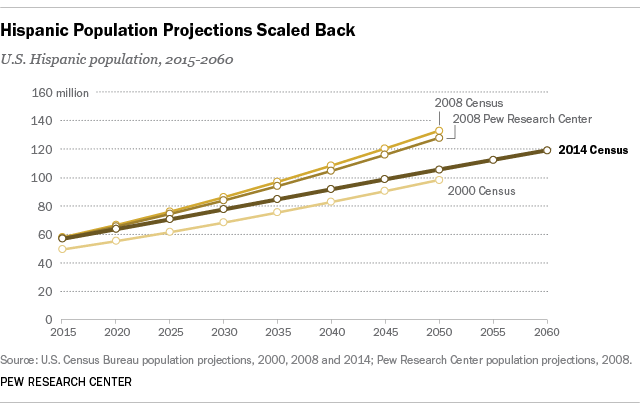 But 2008 turned out to be a high-water mark for the 2050 Hispanic population projection. By 2012, the bureau’s projection had dropped to 112 million. What caused 2050’s projected Hispanic population to decline? Toward the end of the 2000s, immigration from Latin America began to stagnate. The growth in the number of Latino immigrants began to stall in 2008. Since then, Asians have been the single largest group of new immigrants arriving in the U.S. The Census Bureau now projects the Hispanic immigrant population to grow by 57% from 2015 to 2050. That’s lower than a 2008 Pew Research Center projection that had estimated 91% growth over the same period. The slowdown in Latin American immigration traces to the onset of the recession and subsequent slow recovery, and has been driven in particular by a downturn in immigration from Mexico. Nonetheless, Census Bureau projections show the Hispanic population is still expected to grow by 86% between 2015 and 2050. According to the new projections, by 2060, the Hispanic population is projected to be 119 million. Slower projected growth of the Hispanic population has also helped push back the year the U.S. is expected to become majority-minority, though slower growth in births has also played a role in this trend. This milestone is now expected to be reached in 2044, one year later than the bureau’s previous estimate. This slowdown is part of a broader Hispanic demographic shift in which the U.S.-born, and not immigrants, drive population growth. In the 1990s, the Hispanic population grew by 8.1 million due to immigration and 7 million due to births. But during the 2000s, Hispanic births (9.6 million) exceeded the number of new Hispanic immigrants (6.5 million). While these forecasts take into account projected future international migration trends, it’s worth noting they do not account for potential changes in interracial and inter-ethnic birth trends, which may affect how Americans identify their race and ethnicity. For example, 26% of Hispanic newlyweds in 2010 married someone who is not Hispanic. That may have an impact on their children’s identity and that of their children’s children, some of whom may not identify as Hispanic.